In 2013 the new Room of Michelangelo and the Florentines has been inaugurated, at the second floor of the Gallery. It has been a very important step for the New Uffizi fulfillment, supported by the Friends of the Uffizi association. Now the room has crimson walls, as the rooms at the first floor dedicated to the 16th century painting and inspired by the Tribuna colors. 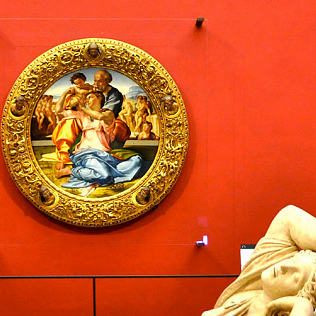 The main artwork is, without a doubt, the Doni Tondo by Michelangelo, which is protected by a non-glare glass. Michelangelo influenced very deeply Mannerist artists that worked during the 16th century. Human figures in the Tondo – the only one painting by the master that we can see in Florence – are clearly inspired by the Laocoonte marble group, discovered in that period. Bright colors became also characteristic of the “New Manner” or Mannerism. Near the Doni Tondo, we can admire the works by the Florentine painting schools of the 16th century: San Marco School – represented by Fra’ Bartolomeo and Mariotto Albertinelli and inspired by Girolamo Savonarola – and the Annunziata School – with works by Andrea del Sarto and Franciabigio. In the room there are also two paintings by the Spanish artist Alonso Berruguete, who lived in Florence and was a friend of Michelangelo. In the center of the room there is the Sleeping Arianna, known also as Cleopatra. It is a big sculpture, an Hellenistic copy from a Greek original one. It has been placed here because – as Vasari wrote in his Lives – Hellenistic marbles, discovered in that century, have been very important for the development of the Modern Manner. For this reason, also the Room of the Hellenistic marbles has crimson walls. It is a chromatic but also didactic parameter, that aims to represent directly the links between artworks in the Gallery.